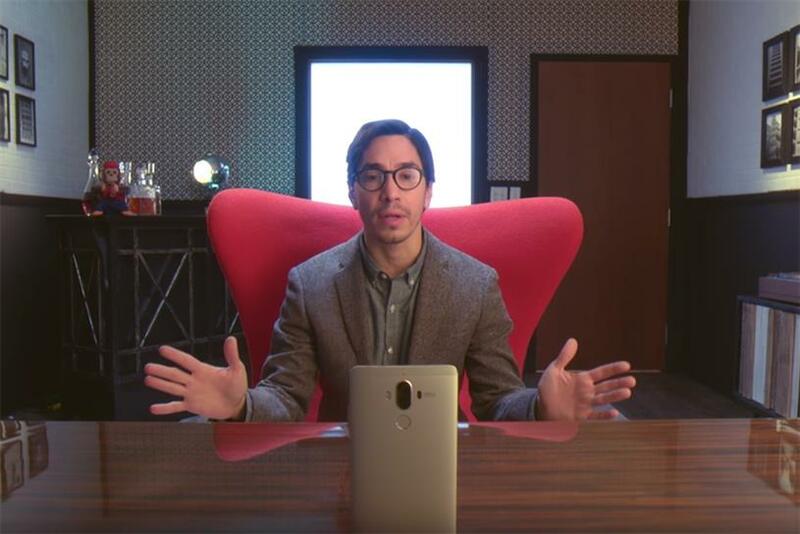 Justin Long, the film and TV actor who spent four years declaring "I’m a Mac" in ads for Apple, is the star of a new campaign from one of the tech giant’s largest competitors, Huawei. Though Long hasn't appeared in an Apple ad since 2009, Jessica Grizzel, group director of WPP's Blast Radius, the agency behind the new campaign, said his history with the Cupertino tech giant was a primary reason the brand approached him. "It certainly was key when we considered Justin as a possible partner for Huawei," she said in an email. In fact, Grizzel says the original concept "was a much more emboldened approach to call out the previous relationship with Apple," but that Long and the client encouraged them to find "a nice middle ground where that idea is inferred as opposed to explicitly stated." The first entry in the campaign is a 60-second film promoting Huawei’s new flagship smartphone, the Mate 9, which launched in the U.S. earlier this month. Titled "The Interview," the film features Long seated across a desk from a Mate 9, anxiously listing his qualifications to direct the product’s new commercial. "I have a ton of experience in tech," he says. "Have I ever directed anything? No. Do I have a director’s outfit? A scarf, a hat and a vest? Yes." The phone responds to Long with various emoji, pictures and videos. "Here’s why I want to work for you," Long continues. "You’re smart, you’re efficient, you can go two days without needing a charge. That is what I call impressive." To signal that Long got the job, the phone shows a video of fireworks. "The Interview" is the first installment in a series called "The Director," created by Blast Radius Chicago, which is part of the Wunderman network. Four new installments will be rolled out through Huawei’s social channels through the Fall, Grizzel said. "The storyline for the video series positions Justin as a new director providing guidance to a series of Huawei products as they are looking to break into the market and make their mark," she said. "There is no doubt that Justin’s history as a pitch-man for Apple adds a nice subtext to the videos and builds on Huawei’s challenger position in the market." Though the spots don’t mention Apple directly, the company has made no secret of its desire to steal business from the Cupertino tech giant. Having grown its market share in China and Europe at a rapid rate in recent years, Huawei has made an aggressive move into America, where Apple still owns about 40 percent of the smartphone market. Huawei surpassed Apple as the No. 1 phone seller in China in 2015, and company executives have said they hope to surpass Apple globally within a few years. "We are going to take [Apple] step by step, innovation by innovation," Huawei’s consumer head, Richard Yu, said during a product launch in November, according to Fortune. Though taking one of Apple’s spokespeople is more of a schoolyard taunt than a business strategy, it does mirror a tactic that yielded Sprint some positive press last year. In a swipe at Verizon, Sprint began running commercials starring Paul Marcarelli, the actor who popularized the catchphrase "Can you hear me now?" talking about his newfound preference for Sprint. In a two-part Oral History of the "Get a Mac" campaign published by Campaign US in December, Long talked about his hesitancy to appear in commercials at all. "I had a reticence about doing it because I didn't want to be a pitch man," he said. "I had had a run of good luck with movies, and those jobs were continuing to come. Now it's different, but at the time there was a real divide between commercial actors and film actors. It wasn't an easy decision." Grizzel said Long was "a great fit for Huawei as an up and coming brand in the US," and that she expects the brand to work with him more in the future. "We definitely see opportunities beyond this initial series and will be working with Huawei and Justin to identify the best way to do that."